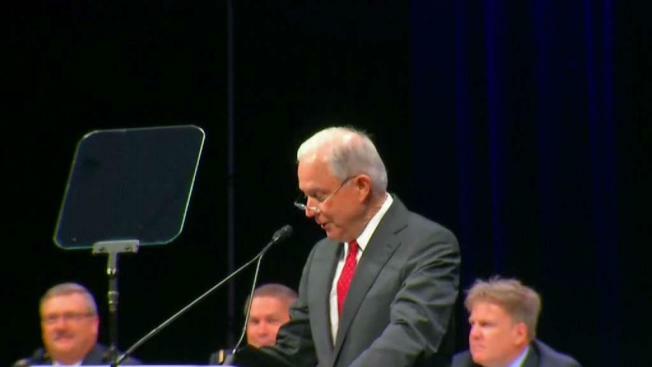 Attorney General Jeff Sessions spoke Monday in Center City at the International Association of Chiefs of Police Conference about his mission to end gang violence. NBC10's Lauren Mayk has the story. U.S. Attorney General Jeff Sessions announced Monday that he has designated MS-13, the violent street gang, as a top priority for a Justice Department task force that focuses on organized crime. "Now they will go after MS-13 with a renewed vigor and sharpened focus," Sessions said at gathering of police chiefs in Philadelphia. "I am announcing that I have authorized them to use every lawful tool to investigate MS-13." The Organized Crime Drug Enforcement Task Forces involve federal prosecutors from the Drug Enforcement Agency (DEA), FBI, Bureau of Alcohol, Tobacco, Firearms and Explosives (ATF) and Immigration and Customs Enforcement (ICE), as well as other agencies. The designation directs officials to pursue all possible charges during prosecutions, including racketeering, gun and tax law violations. "Just like we took Al Capone off the streets with our tax laws, we will use whatever laws we have to get MS-13 off our streets," Sessions said at the International Association of Chiefs of Police in Center City Philadelphia. MS-13 has become a prime target of President Donald Trump’s administration amid its broader crackdown on immigration. The international criminal enterprise has tens of thousands of members in several Central American countries and many U.S. states. The gang originated in immigrant communities in Los Angeles in the 1980s then entrenched itself in Central America when its leaders were deported. MS-13 is known for hacking and stabbing victims with machetes, drug dealing, prostitution and other rackets. Its recruits are middle- and high-school students predominantly in immigrant communities and those who try to leave risk violent retribution, law enforcement officials have said. MS-13 members have been accused in a spate of bloodshed that included the massacre of four young men in a Long Island, New York, park and the killing of a suspected gang rival inside a deli. The violence has drawn attention from members of Congress and Trump, who has boasted about efforts to arrest and deport MS-13 members across the United States. "MS-13 threatens the lives and well-being of each and every family and each and every neighborhood that they infest," Sessions said. "They leave misery, devastation and death in their wake. They threaten entire governments." Law enforcement officials believe some of the recent violence has been directed by members of the gang imprisoned in El Salvador. In July, Sessions went to El Salvador for a series of meetings with law enforcement officials in an attempt to step up international cooperation against the violent gang. Both Trump and Sessions have blamed Obama-era border policies for allowing the gang's ranks to flourish in the U.S., though the Obama administration took unprecedented steps to target the gang's finances. Federal prosecutors have gone after MS-13 before but say they've recently seen a resurgence. Sessions also addressed the gathering of law enforcement leaders on Saturday, focusing on "forging new relationships" between local and federal authorities.